I come from Lincolnshire, where the sausages are fat and juicy, herby, peppery and bursting with flavour. At least they are when they’re from a good butcher. We’re lucky in Suffolk, where I live now, in having some good butchers who make excellent sausages in various flavours and sizes. But if you’ve got the time, nothing beats making your own bangers. 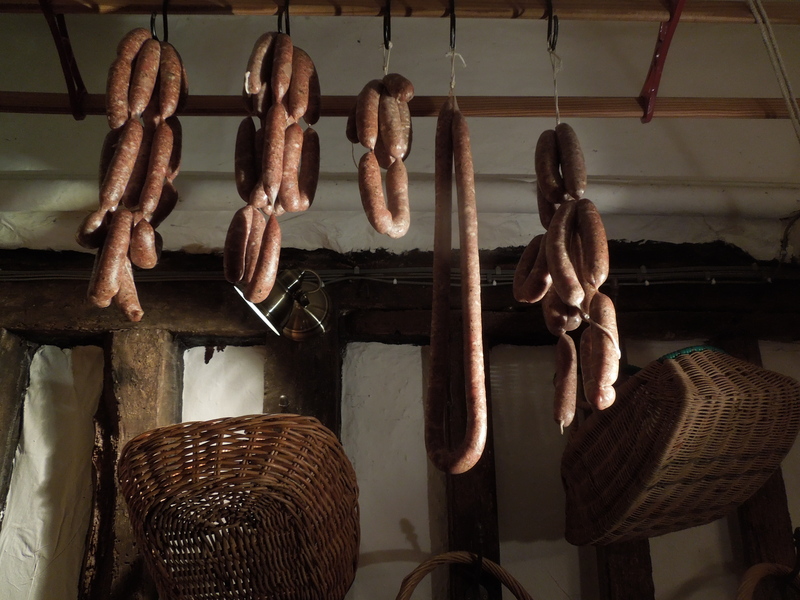 Last year I wrote about accidentally defrosting our entire stock of pork and turning rather a lot of it into sausages using a recipe from Eliza Acton’s Modern Cookery For Private Families, first published in 1845. She was writing at a time when there was no refrigeration so used what by today’s standards was a phenomenal amount of salt. Her recipe was also heavily spiced with mace and nutmeg which can taste a bit medicinal in large quantities. I tweaked the recipe then but I’ve revisited it to make it more acceptable to modern tastes. The sausages are still quite highly-flavoured, so if you prefer them blander please adjust the seasonings accordingly. 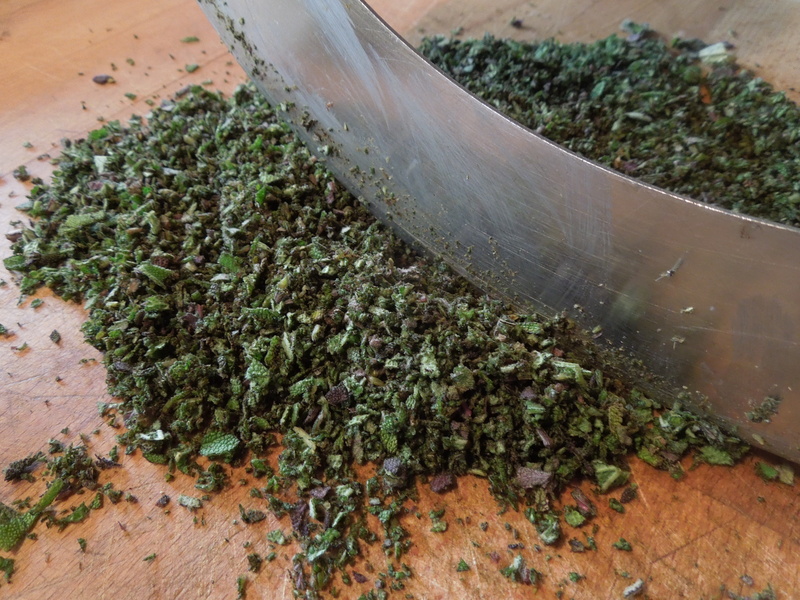 You can also make them herbier if you like by adding thyme leaves and maybe snipped chives. I wanted to stay close to the traditional recipe. 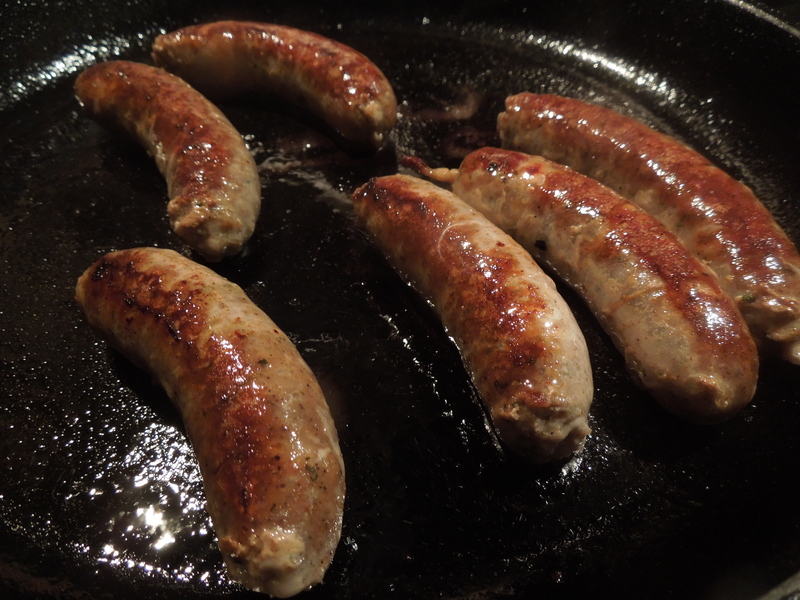 A few notes: sausages are lighter in texture if the meat is coarsely minced. I used 50% belly pork which had already been minced finely by the butcher and 50% pork shoulder which I put through the mincer screen with the biggest holes. I also added fine white breadcrumbs in a ratio of 10% of the weight of the meat. This isn’t essential but it does improve the texture. Sausage-making is a bit of a faff so I don’t think it’s worth bothering unless you’re going to make quite a lot and you have a freezer to store them in. I put the sausage meat in traditional casings, available from online suppliers such as Weschenfelder (or chat up your butcher) but the original recipe also allows for them to be cooked skinless, in patties. 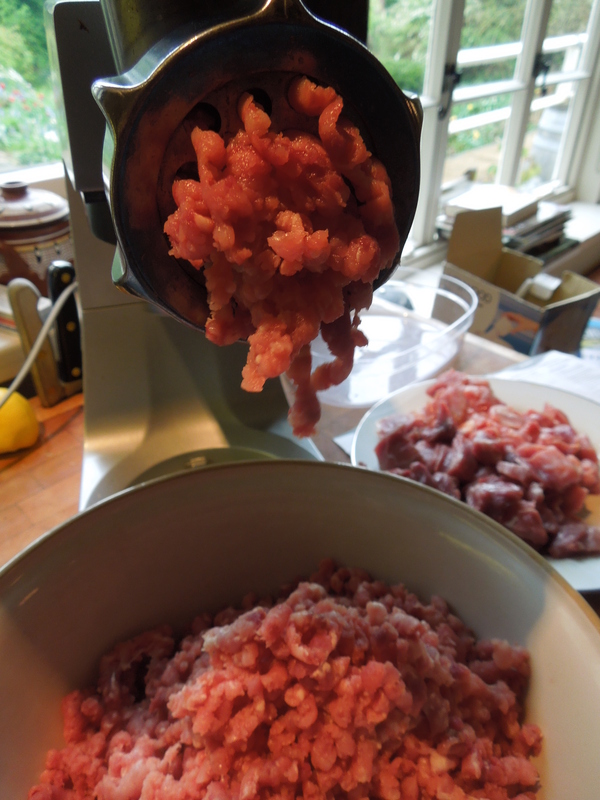 You can fill sausages skins using a funnel but it’s easier to use a sausage filler attached to a food mixer. 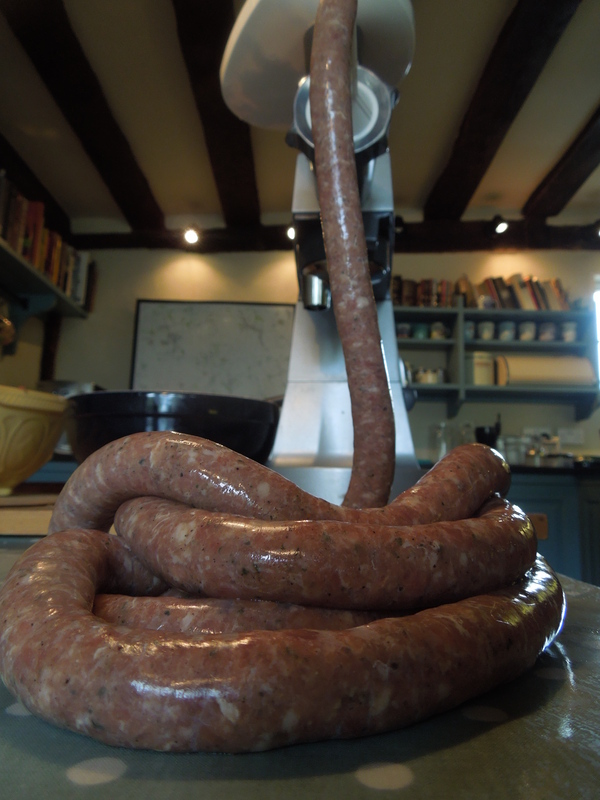 Sheep casings will give you a slimline sausage somewhat bigger than a chipolata; hog casings will produce a fat banger. Soak the casings, if using, in warm water for half an hour. Mince the meat and put it in a very large bowl. Chop the sage finely. Add the breadcrumbs and seasonings and mix well – it’s best to get your hands in there. It’s important at this stage to fry a small patty of the sausage mix to test the seasonings. Adjust to taste. If you’re stuffing the sausage meat into casings, push the casings onto your sausage filler and feed the sausage meat into the hopper. Tie a knot in the end of the casing. Ease the sausages off the nozzle as it fills, trying not to either overstuff them, which could burst the skins as you fill them, or to get air pockets in the sausages, when they may burst as you cook them. This takes practice and it helps to have one person feeding the sausage meat in and another handling the sausages the other end. Twist the sausages into links and then twist them again to make hanks, hard to describe and I’m not very good at it but there are demos on YouTube. Congratulations, you’ve made your own home-made sausages! Hang them up somewhere dry and airy for a few hours or overnight, otherwise they will leach liquid. Store, well-wrapped, in the fridge for up to five days or freeze them for future use. 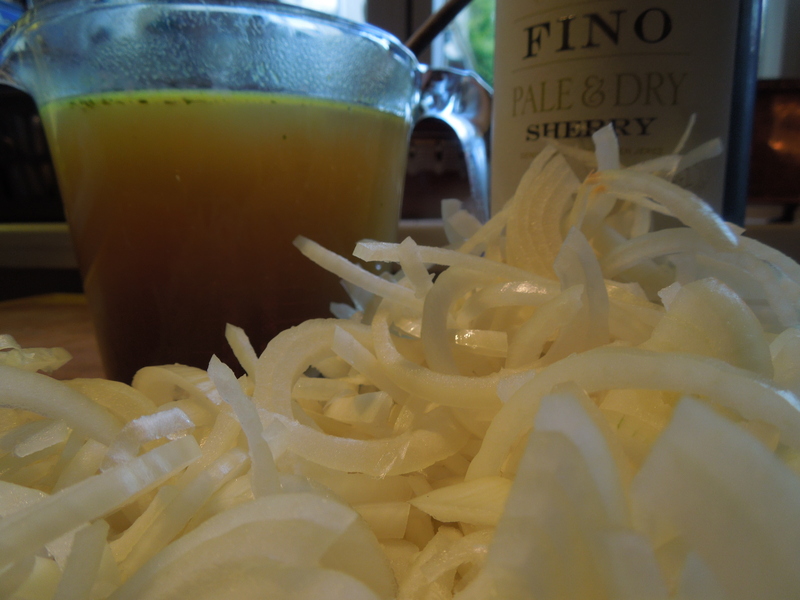 They’re very good with onion gravy …. Melt the butter in a wide, deep, heavy-based pan, add the onions, put a lid on and cook over a low heat, stirring occasionally, until they’re golden brown and soft. Stir in the flour and cook for a minute or two then stir in a good slug of the alcohol of your choice. Gradually add the stock, still stirring. 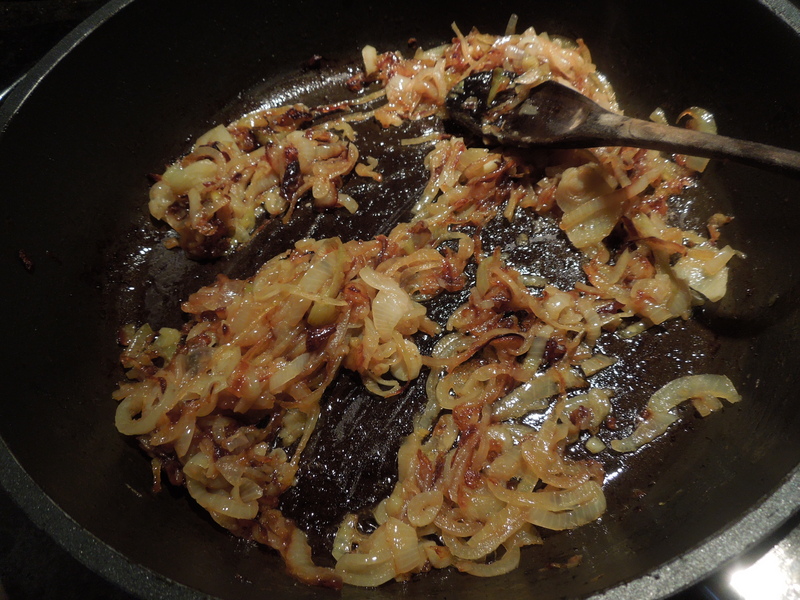 Season with salt and pepper and add the Worcestershire Sauce, if using. Now cook over a low heat for around 15 minutes or until the gravy has reduced and thickened to the desired consistency and the flavours have amalgamated. It works with most red meats but it’s particularly good with bangers and mash. 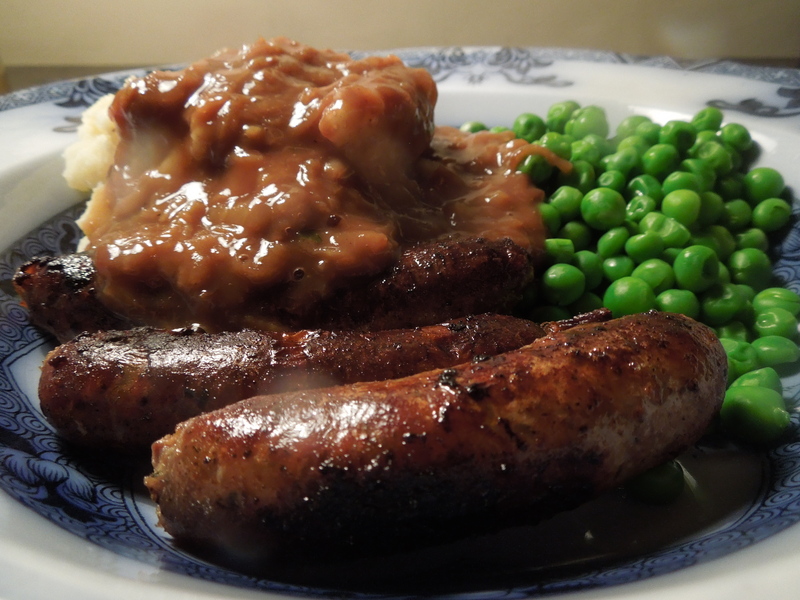 This entry was posted in Mains, Pork, ham and bacon and tagged eliza acton, home-made sausages, Old English Sausages, onion gravy, pork sausages by Linda Duffin. Bookmark the permalink. Thats impressive and looks so delicious!! Look delicious.. and I’m going to make these (confession: with shop bought sausages, as sadly I don’t have the right accessories to make my own) the gravy sounds and looks really yummy.. Thank you, Linda! Mrs P. This is excellent. I have made my own a couple of times and it is great fun. Nothing tastes like home made. Thanks Conor. Time-consuming but as you say, fun, and they taste good. 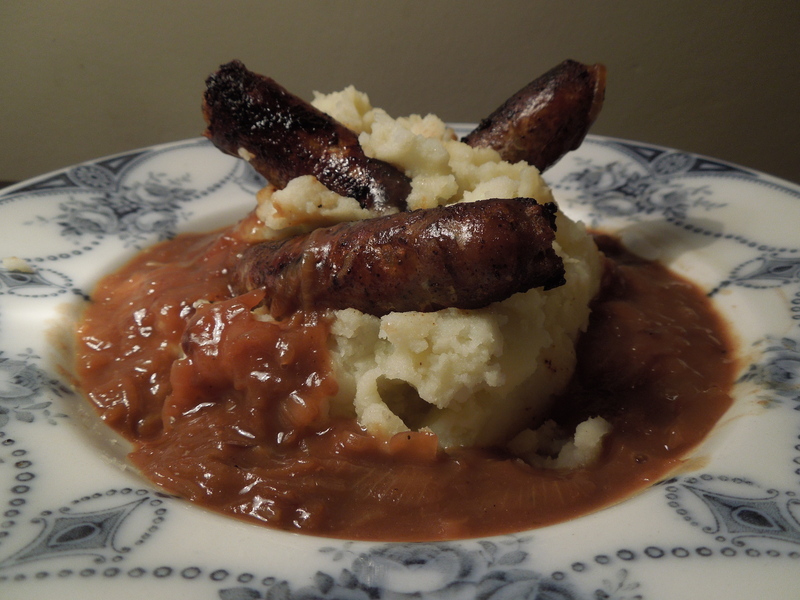 Bangers and mash with onion gravy, proper comfort food. Love your pictures too. I’m currently on an extended holiday in America and the only food I miss is a proper English pork sausage! The ‘sausage patties’ out here are truly grim. Thanks Penny, glad you like the bangers and the pix. Lucky you though, on an extended holiday in the US … jealous (though not of the sausage patties). Cor, that is banger dedication! I bought my brother-in-law a sausage-making kit from Lakeland for Christmas…I think he had fun with it but they weren’t pretty. Love the look of your kitchen, by the way.